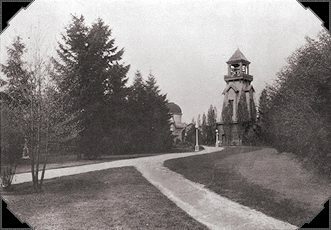 Built in 1904, the Chimes Tower was originally a water tower for pumping water from the lake. The chimes consisted of 12 bells, donated by Col. A.J. Blethen, Seattle Times publisher. They were enclosed in the tower in 1914 and faithfully played by UW music graduate, George Bailey, who was blind. He played from a repertoire of over a thousand songs during the years 1917-1949, when the tower burned down.